With the temperature starting to creep up, the produce selections are getting better and better. You may shop exclusively at your local grocery store, use a CSA for produce or have your own garden. No matter where your produce comes from, it is always wise to use a produce wash in order to remove excess dirt, pesticides and bacteria from the surface. Even organic produce may come in contact with safer pesticides so it is important to wash all your produce no matter what the source. Wondering why I use what I use as ingredients in my produce wash? 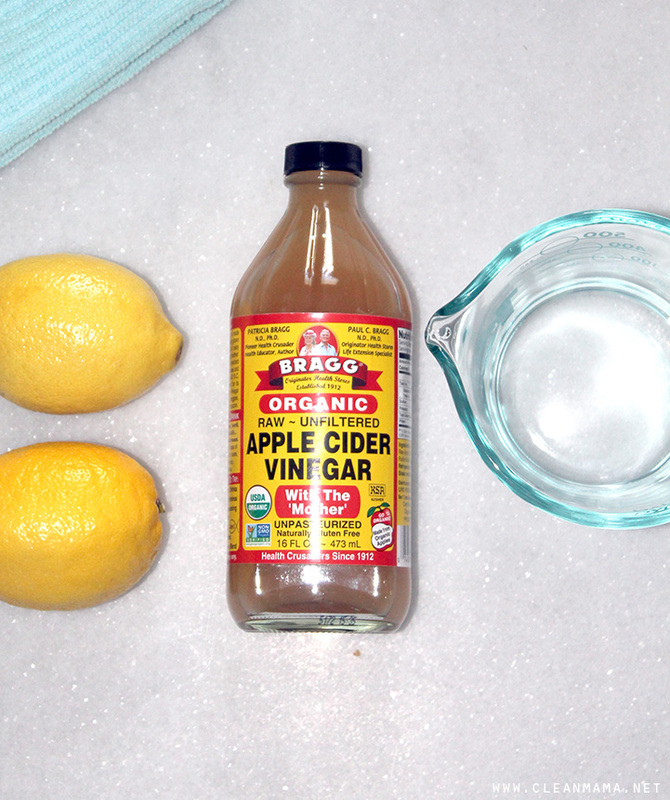 The apple cider vinegar serves to cut back on the bacteria and pesticides. Lemon juice is naturally anti-microbial so the combination of these two natural ingredients work in tandem to effectively clean your fruits and veggies. Cleaning your produce also helps to extend their freshness, especially if you wash it as soon as you bring it in to your home. Less waste and less money is a win in my book! 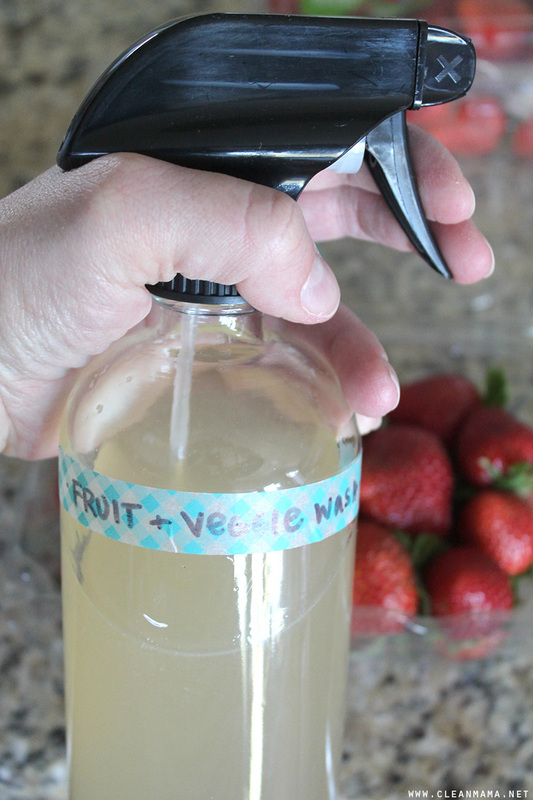 I’m sharing with you two ways to clean your produce: a spray method and a soak method. 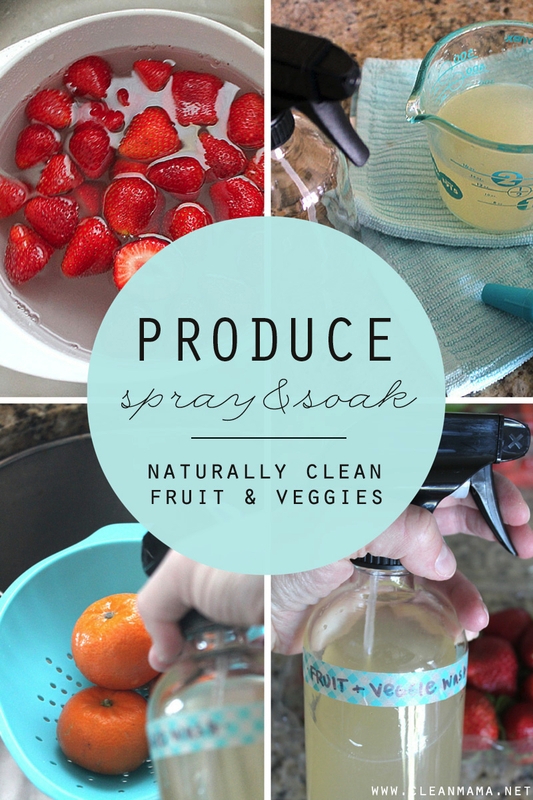 The spray method is ideal for washing individual fruits and vegetables while the soak method works well for washing batches of produce or trickier produce like broccoli. You can use the same recipe found below, it’s just used in a different way. Regardless of what method you use, rest assured that your produce is cleaner thanks to two natural ingredients. 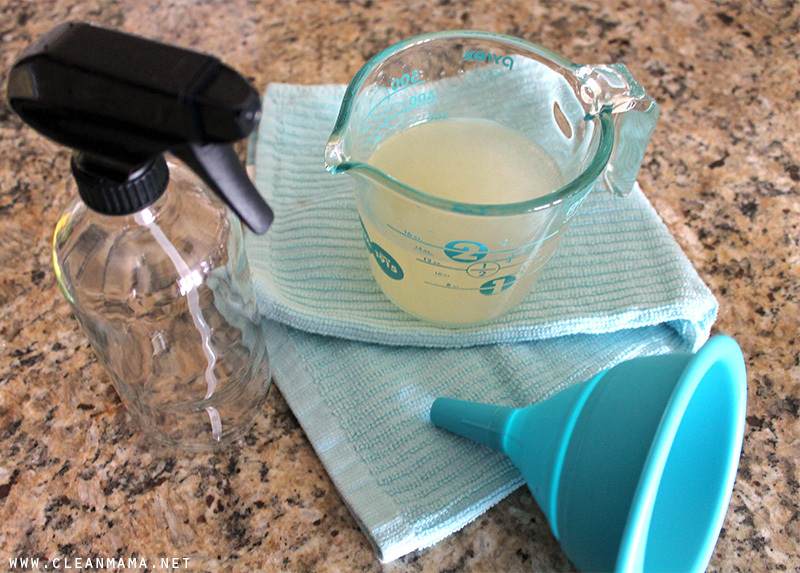 Add ingredients to a spray bottle (make sure it’s clean) and shake to combine. I like to use my glass spray bottles found here for this purpose. I used a little washi tape and permanent marker to make an easy label. 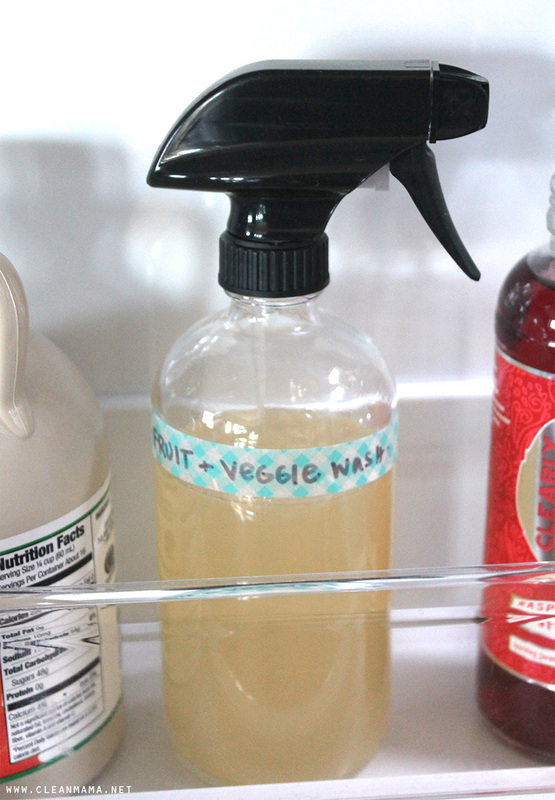 Spray liberally on fruits and vegetables and rinse in cold water. Prepare as usual. I recommend keeping this in the refrigerator for up to a month for optimal freshness. This recipe can easily be doubled or cut in half as well. 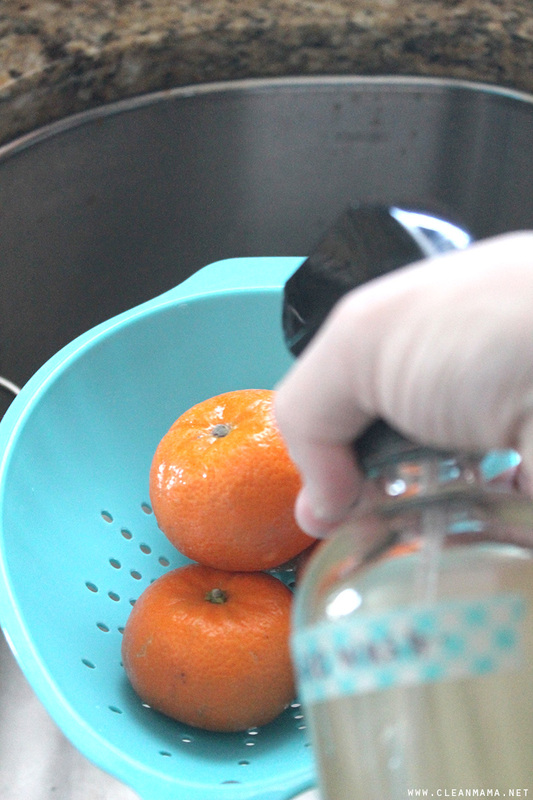 Use 1/4 – 1/2 cup (amount depends on how much produce you’re washing) of the Fruit and Veggie Wash along with cold water in a large bowl or your freshly cleaned sink to soak your produce. 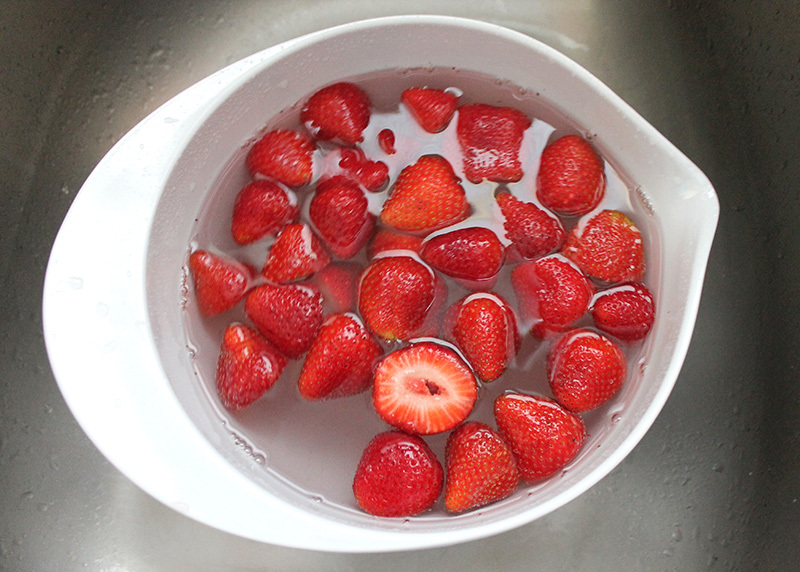 Allow your produce to sit for 5-10 minutes and then rinse with cold water. 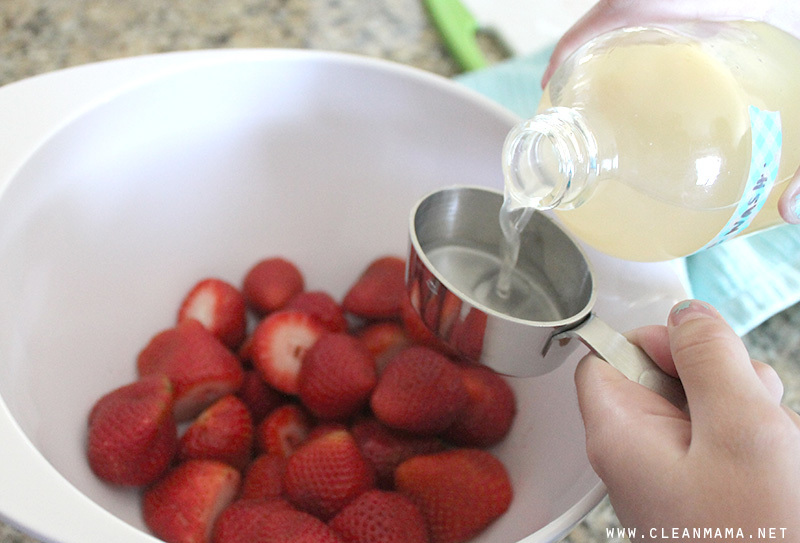 This works great for all those fresh berries come summer and the vinegar will help them stay fresh longer. Need to mix up more or less produce wash? You’ll notice that it’s equal parts water, apple cider vinegar, and lemon juice – increase or decrease to fit your needs. 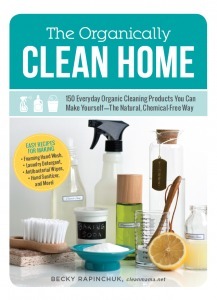 This recipe is from my book, The Organically Clean Home – find out more here! Thank you for sharing an easy DIY! I’m so happy I already have everything I need to try this…minus the fresh fruit. Time to go shop. Hee hee. Do you sell a spray bottle label for this recipe? Does this need to be stored in the fridge? Thanks! Does this alter the taste of the produce?